A screenshot of the accept / decline interface. It boggles my mind why they insist on keeping everything as barebones as possible. Constantly pretending they are a team of 5 with a game that barely keeps them afloat. Features take time. Tournaments are a long requested game mode and we want to put something in the hands of the community as soon as possible. When we first announced tournaments as a beta, we meant that as a true beta. There might be some bugs, and there might be some features missing from it you thought were really important. We still think it will be really cool. Because tournaments mean so many different things to different people, it made sense to get together the pieces of a tournament that are absolutely necessary, then build on it one piece at a time as we gathered community feedback. some people surely has grown graey hairs since february until now, but yeah, impacient people. 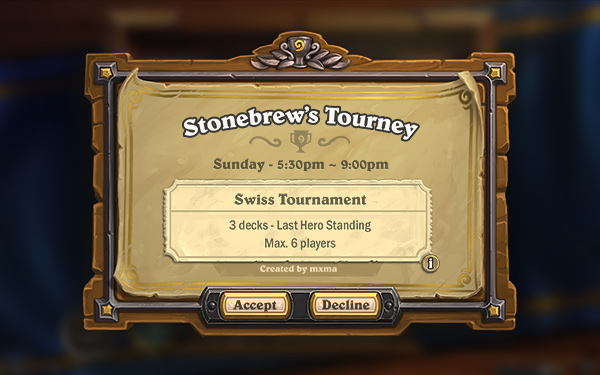 Once Tournament Mode arrives, we'll finally have a reason to go to Fireside Gatherings. It's nice to see we get a feature that was promised years ago now. It's not like we're almost half a decade into this game's life. That goes without saying. I still can't get over the fact the ancient bug that causes the mana crystals on the bottom left of the board to incorrectly display your remaining mana, which happens more often when you ramp or overload, is still a thing. Honestly I wish (as several other people have mentioned here) that there was a test version available like for Overwatch or Rainbow Six Siege where players can actually have a meaningful voice in the upcoming changes or content, both in the forms of collectible data and player experience feedback. This way we wouldn't have to entirely rely on the most experienced players to attempt to predict how a certain change or two will effect the game. We could actually see the new interactions first hand and translate or experience into a respectable and more informed voice. And the crazy meta that we can only get after card changes or expansion releases would not exist, because everyone would have weeks to see the new cards and create the new Tier 1 meta decks before those cards hit the live servers. No thanks. A test server would be good for feature testing, like this tournament mode (or even MORE deck slots?! ), but not for anything related to cards. Blizzard simply needs to be faster to react to broken or unenjoyable cards that slip through their internal testing. They have a considerably small team to work with and a surprising amount of content and event planning to sort out though. I'm not saying they should include EVERYTHING in this theoretical test game, but it could certainly be a great tool if a design challenge arises that would benefit from loads of data and testing. Edit: a.k.a. they don't need to give early access to expansions for this to work, but for balance changes? something like this could definitely speed up the implementation process. The problem is, with Team 5, the delay in releasing a balance adjustment isn't because of the adjustment itself. Of course they take some time to decide what the best way to nerf a card is, but that's the relatively fast part of the process. The slow part is the deliberation on whether a card needs to be nerfed or not. They hunch over petabytes of data in a dark corner of Blizzard HQ to determine whether a card is actually overpowered or just perceived to be. When that data suggests it could be either, they look at community feedback to see whether people enjoy losing to the card or not. Simultaneously, they think about the overall design of the game and potentially upcoming mechanics - would this card cause a (larger) problem at a later date? All of these processes take a lot of time. And, as you probably have guessed by now, none of them would be sped up by a test server. They happen on live servers, where the amount of data gathered is exponentially higher than the data that would be gathered from a test server. I'd agree with you if the problem with balancing seemed to be that they could never decide on how best to balance a card, but from what I've observed, that's not the case. They're usually confident and quick when it comes to how to nerf something. So, what do we win in a tournament? Packs? Cards? Dust? Cardbacks? Ah, I was under the impression this mode was going to be something similar to Arena with rewards and all that; my mistake. I'm really looking forward to the tournament mode. Sounds like a good mode. I think more people will play independent tournaments since it will be a lot easier to enter and to organize them. It's a shell that needs filling and they are telling us such. We've long since been yelling for a 'tournament mode'. Yet when they ask what that exactly looks like they get nothing concrete and no consensus. I've seen the topic discussed. The second you get past "tournament mode YES!" you get 10000 different ideas that contradict and no one agreeing on anything. So it looks like Blizzard gave up on waiting. The options suggested so far sound like items the Tournament scene has been demanding for forever so those are no brainers. After that, they want us to go in, go "ugg, it's missing XYZ" then they get some idea on what we actually want. It's akin to asking a bunch of folks what pizza they want, getting arguments, then just calling and ordering a cheese pizza. You'll find that ***VERY*** quickly the group starts putting out decent ideas for topings when the #*) hits the fan. Myself I don't think it needs to be something for the majority.. not yet anyway. The focus should be on actual tournaments like HCT and dreamhack. Let them try it, decide what they want from it, then add those in so that we can actually have a healthy tournament community. Then later they can incorporate the regular tournaments we have (there's actualyl A LOT of tournaments that go around but if you mostly just play the game and don't dive deep into the community you'll never know) so that they can be run in-client and be accessbile to the general public. "Features take time. Tournaments are a long requested game mode and we want to put something in the hands of the community as soon as possible. When we first announced tournaments as a beta, we meant that as a true beta. There might be some bugs, and there might be some features missing from it you thought were really important. We still think it will be really cool. Because tournaments mean so many different things to different people, it made sense to get together the pieces of a tournament that are absolutely necessary, then build on it one piece at a time as we gathered community feedback. " What have I said before about things in a video game taking time? This right here is the finishing touch to my point. Thank you Dean. I operated free-to-play on-line games for twenty years, beginning with text MUDs in the early 90s up to graphic RPGs in the mid-2000s. I quit when WoW came out and ate all of my time. It's hard to balance things. It's hard to make decisions. It's hard to test the interaction of complex systems and get it right. It's not as simple as, "Just nerf this card," or "just add this feature." Changing a card statistic doesn't take much time development-wise, but you aren't thinking about the Type II errors. So we nerf Card X, which is currently an effective counter to Cards A, B, and C. Well, do Cards A, B, and C become a problem? And then the same people are back in 2 weeks bitching that those cards are too good and need a nerf? Card X may be the only thing keeping 3 other otherwise overpowered cards in check. You can't just go around every week and rearrange the game by nerfing whichever card people are bitching about that week, or that's all you'll ever do. And, if you're constantly tweaking cards based on a "Squeaky Wheel gets the Grease" philosophy of player management, you empower the loudest complainers, who are also usually the least rational and thoughtful. Also, they're usually a small minority. They just hate X and want it changed. They see their little myopic corner of the game and are frustrated, so they complain on Reddit. When you're a developer, you can't assume those people all know what they're talking about, especially when you have an equally large (or even much larger volume) of level-headed players whose qualifications you know, and whose opinions you trust, and whose conclusions match what you see in your own data. That's not to say EVERYBODY complaining is an immature whiner and is wrong. Far from it. It's just that, "Blizzard Y U TAKE SO LONG WHEN WE ALL YELL SO LOUD" is a stupid criticism. I do think they're TOO deliberate with nerfs, but I'd rather have them be too deliberate than not deliberate enough. And, they also have other timings to consider. It's not just you at your desk they have to think about - there other plans, other events, other tournaments, other priorities all completing for the developers' and designers' time. They have 100,000x more to deal with than what you see on your screen. And finally, adding a new feature is not trivial. Software development is a classic case of the 80/20 problem. The first 80% of it takes 20% of your time to make. The last 20% takes the other 80%. Ask anybody who's ever written a game. I sat down last fall and wrote an MORPG server from scratch in C++ in my spare time. It took me about a month of dinking here around here and there to build an account/login system, chat system, basic world navigation service, on-line creation system, skill tree system, combat and magic/effect system, quest system, trade skill system, guild/clan system, and advancement/badge system. That's 80% of what the game does. It would require a team of 20 people working a full year to actually make a playable game out of that. I'm not saying those of you with complaints or concerns don't have valid complaints or concerns. But I do think a substantial volume of complaining originates from a place of blissful ignorance about the realities of running even a small game development team. I had lunch a while back with one of the chief engineers for League of Legends, he's an old school 90s era coder like me, and we were talking about how hard it is to change anything when you have a huge subscriber base. He was telling me about how they wanted to add a few additional data points to track during matches for analytics purposes, and they spent weeks discussing it, because at the volume of records they store, even adding 100 bytes of data to match records will cost many millions of dollars in increased storage requirements. 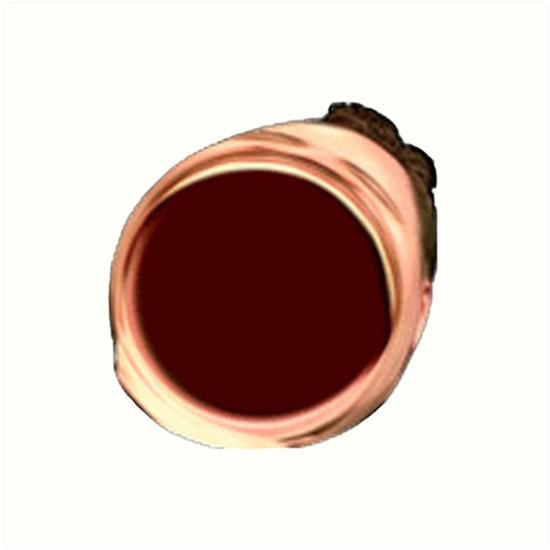 So ya'll want a dedicated software team with a burn of at least $15-$25M to churn out content constantly, put on tournaments, be on all social media, respond instantly to all problems, perfectly balance the game, manage a community of 50 million people, implement new features, fix old bugs sooner, and you don't want to pay for any of it. Sheesh. I'm remembering why I quit running games like this.